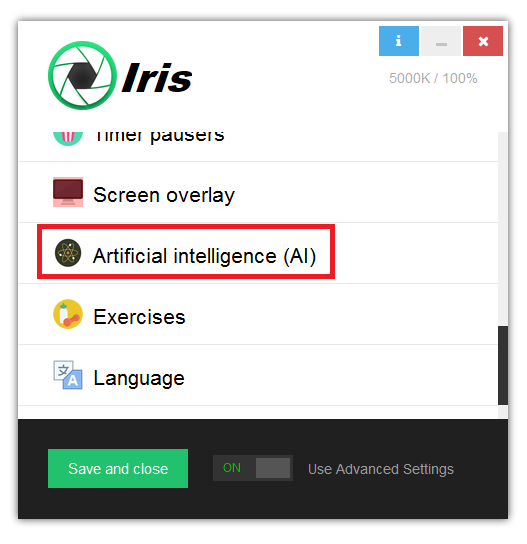 In the Artificial intelligence page you can enable some really nice features and inovations I have integrated into Iris. Most of them are disabled by default for several reasons. 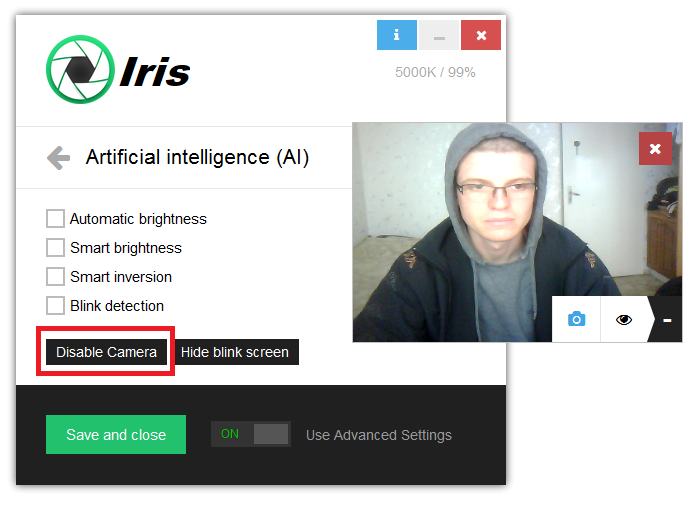 Some of them use the Camera and it will be super creepy if you install software for the first time and the Camera is ON. I can asure you that the camera is used just, because this is the only way to make some features working and nobody wants to watch you. Everything happens on your computer and no one has any access to your camera. Some of them use a lot of CPU. This is deal breaker for people with old or slow PCs. Some of them like the blink detection are still experimental and doesn’t work quite good. 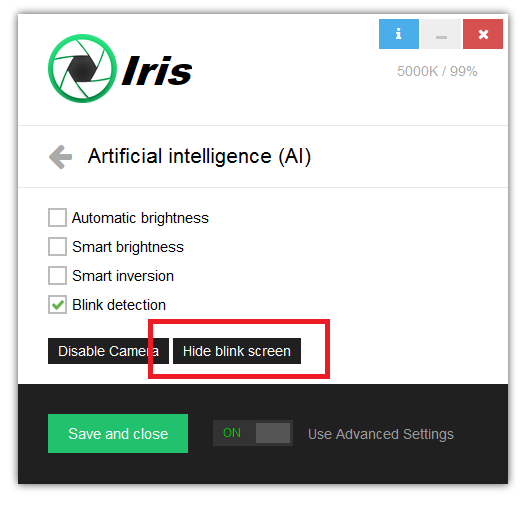 Features like Automatic brightness and Blink detection will not work if your camera is disabled and they will not turn it ON automatically. You need to manually enable your Camera. The reason for this is respecting the user privacy. 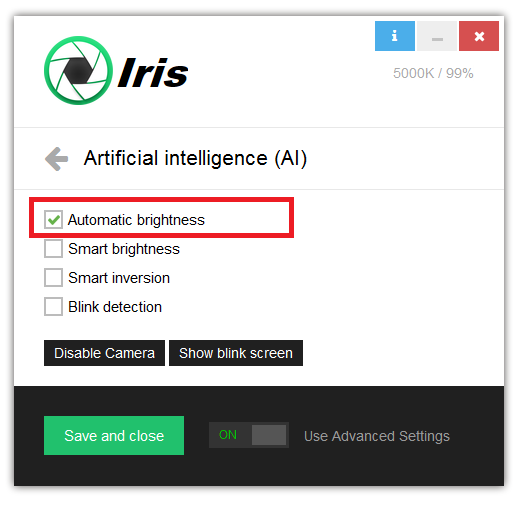 If you have Camera and your camera is enabled this feature will match your monitor brightness to the detected lightness in the room. 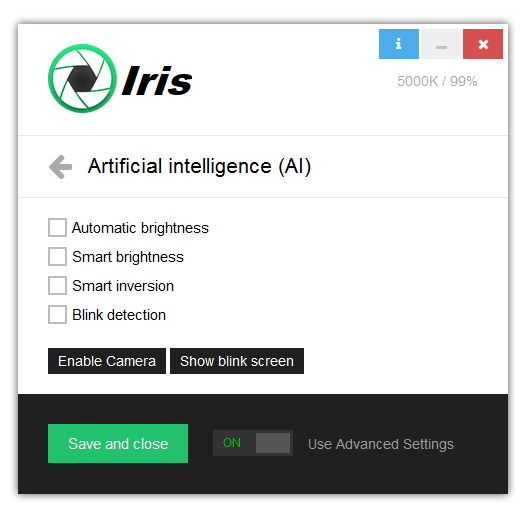 The lightness is detected by processing your camera input from time to time and calculating the brightness of the input. A slow transition will happen when the lightness level is changed a lot for example if you turn of the lights during the night. It will take 10 to 15 seconds for the brightness to slowly adapt. For this feature to work your Camera should be enabled. 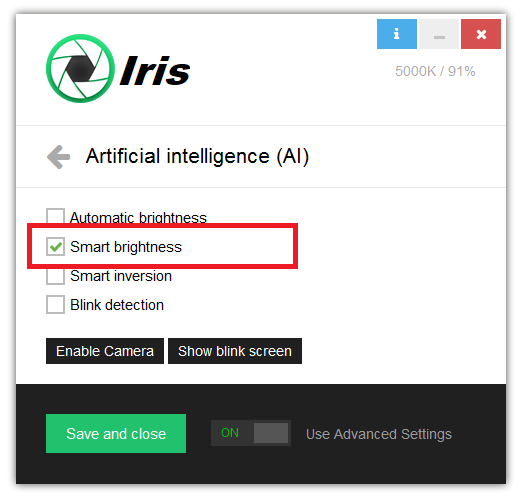 Smart brightness will analyze your screen and will change your screen brightness with calculated brightness modifier. 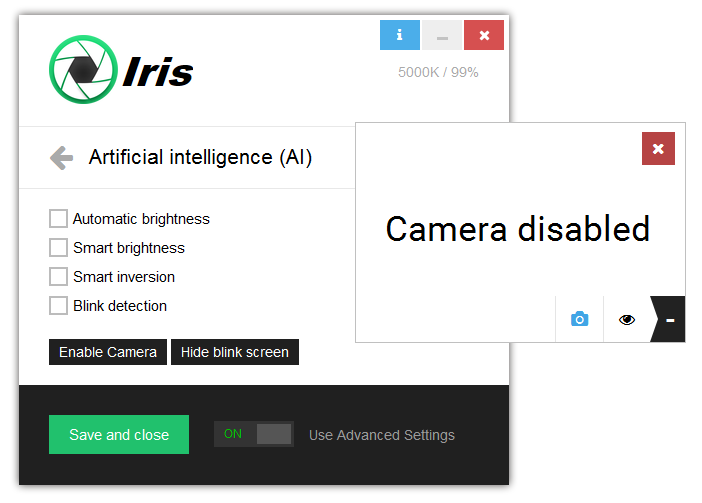 This feature doesn’t require your Camera to be enabled. 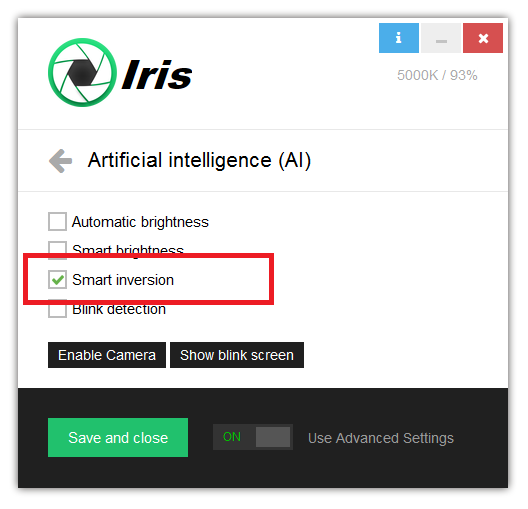 Like Smart brightness, Smart inversion will also analyze your screen contents, but instead of changing the brightness when the screen has white colors it will invert the Screen colors. I personally don’t use this, but I made it for people with eye problems and I know of several thousand people who use this feature. This feature doesn’t require Camera to be enabled. 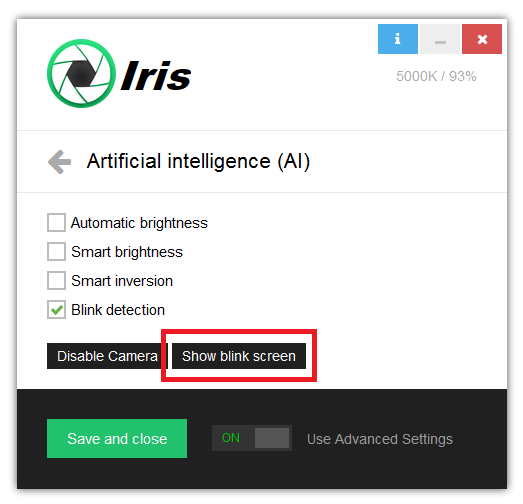 Blink detection will use AI and the input from your Camera to detect how often you blink. It doesn’t work perfectly and is still a lot of experimental, but it will be nice if someday works perfectly. Blink detection will also use a lot of CPU, because it needs to monitor your eyes constantly. 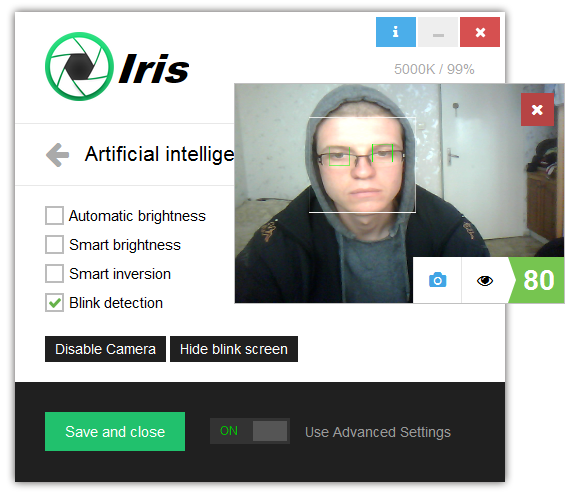 The white rectangle shows the detected face and the green rectangles show the eyes detected. 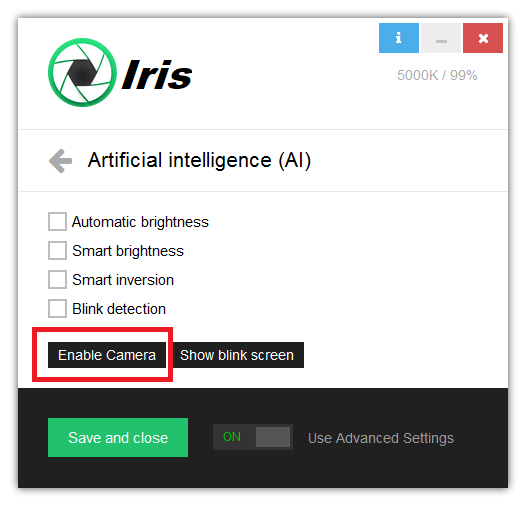 This feature require your Camera to be enabled. Smart brightness and Automatic brightness works nice at the moment and I personally use them. I still don’t see much point into the Blink detection and Smart inversion.